Here is a very thorough review of advantages of Peroxide. Well, I have and was compelled to research fact/fiction as that brown bottle has been under my sink ever since I moved out of Mom’s house and took the spare bottle with me. The photo above is of a really old bottle and one just purchased ($.89/quart). 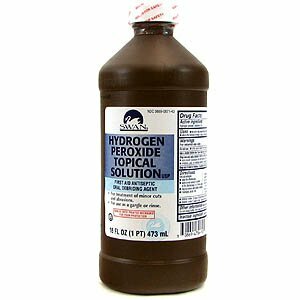 Hydrogen Peroxide does disintegrate with light–hence the brown bottle–and age; the small bottle will be disposed of as it sports a Snyder Drug Store label–Snyder’s has been out of biz for over 10 years. The great news is that the contents can be poured down the drain; HP is water and oxygen and decomposes into it’s parts. So pour away, rinse and recycle bottle. I never know what to do with Clorox/bleach bottles; can diluted/rinsed contents be poured down the drain? Duh, guess so; just realized diluted bleach goes thru the washing machine and into sewer/septic. Whew, another dilemma that won’t keep me awake at night! Essentially, the email touts peroxide over ‘Clorox’. (FYI: Clorox is a brand name for a company who makes both ‘Clorox’ and Hydrogen Peroxide.) Many of the claims in the email are true and some aren’t so much. Review the email for yourself at snopes. Clorox: a bleach/disinfectant made from sodium hypoclorite, basically liquid chlorine, that is extremely corrosive and will eat away fabric, skin, metal, etc., in its undiluted form. Hydrogen Peroxide is also a bleach/disinfectant whose chemical composition is oxygen and water. Both of these ingredients are non-toxic and can be washed away with water with no environmental concerns. One caveat: HP is a bleach and will bleach anything it contacts. However, the common concentration of 3% available in drug stores, is mild enough to use for mouth wash and toothpaste. HP is probably best used in the home as a disinfectant due to it’s safety and odorless composition. And, HP is the preferred hospital disinfectant. Check out The Many Benefits of Hydrogen Peroxide by Dr. David G Williams. This is just one of many, many websites with similar information but liked this one due to its organization and writing. I find the garden applications most helpful. HP (H2OO2) occurs naturally in rainwater and this is why rainwater is more efficient than tap water; H2OO2 provides more oxygen for plants thus promoting growth. Oh yes, highly concentrated solutions of hydrogen peroxide are used for rocket propellant. Having read this I thought it was really informative. I appreciate you spending some time and energy to put this informative article together. I once again find myself spending a lot of time both reading and commenting. But so what, it was still worth it! Aw, this was a very good post. Taking a few minutes and actual effort to create a really good article… but what can I say… I put things off a whole lot and never seem to get nearly anything done.